Visit Yelp for additional testimonials. You may also be interested in the Yelp testimonials that are “currently not recommended.” Quite excellent, actually. "My child started her violin lessons with various teachers at a young age. Because we did not choose a teacher wisely, she did not progress much for two years. When she finally started learning from Beverly, her progress was significant, that is, after Beverly spent endless hours correcting her mistakes. Beverly is a very effective teacher and devoted in her teaching. Her studio is spacious and comfortable. I feel so relaxed and calm whenever I sat in her studio waiting for my child to finish her lesson." "When I first came here, I was so eager to find a violin teacher to continue my lessons since I just started to play not long ago. I am glad that I found Beverly. She is kind and elegant, very patient too; I learned a lot of important violin basics from her, which was what I needed. My favorite part of lessons was playing violin doubles with her, or with her other students. I also enjoyed all those violin recitals. It was fun to play in front of her other students and be their audiences as well. (plus the good food!) I had an amazing time with her, and I will definitely miss her when I leave for university in fall." As a child I wanted to play the violin. My school had a band but no orchestra so I ended up playing the French Horn. I enjoyed this but never lost the desire to learn the violin! Finally after college and my job settled down I decided to try and learn the violin. Beverly is a great teacher. The violin is not easy to learn but she is patient and supportive! I really enjoy playing the violin and and very happy I chose Beverly to help me fulfill my childhood dream! Beverly is kind and patient. She is flexible, professional and works with my daughter in the way she needs. Her goal is for learning the violin & music and she does not require it be done a particular way, which we really appreciate and has produced terrific results." "I just wanted to take a moment to say thank you (Beverly). Angela and I, along with everyone who hears Clara play are simply amazed at the advances she has made since starting her lessons with you. The better she plays the more she enjoys it which makes it easier and so much more gratifying for all of us." I’ll allow myself to boast here only because it speaks to your excellent teaching, (and Clara’s hard work), rather than any of our doing. Bravo! "Our daughter is 10 and has taken violin lessons from Beverly for over three years. She's really improved throughout the years and is more confident in her ability to read music and play in front of an audience. Some days my daughter is tired after a long day at school and not in the best of moods, but, Beverly takes the moods in stride and cajoles her into a more positive mood and acknowledges her feelings. Beverly is great with children...patient, and kind, yet firm. Beverly moves students along in their skills and keeps challenging them along the way. It's always fun to hear how much other students have improved at the smaller recitals and bigger one in spring." "Well organized, great lessons" "Beverly's violin lessons provide positive, challenging instruction. She takes a very organized approach to teaching. A lot of focus is placed on what you need to improve on personally. As you progress, constant attention is paid to any bad habits that you may be developing that might impact your playing in the future. All of these things are very helpful for beginners like myself. I highly recommend her as a teacher. The violin studio is a great place to work as there are large mirrors on the wall." "I am so thrilled with my new violin lessons and my new teacher. Beverly is a beautiful lady and excellent teacher. I look forward to every lesson. I have hopes to play in some kind of band some day." "Beverly provides a challenging, fun teaching environment using a variety of techniques. 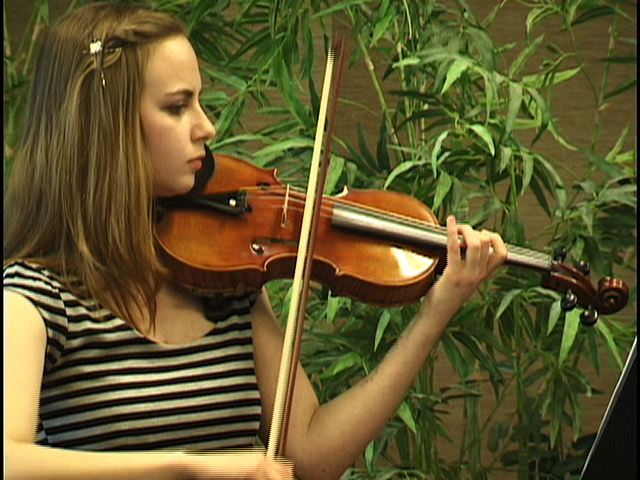 My daughter's violin-playing and musical knowledge has really excelled under Beverly's guidance." "A highly talented teacher, Beverly motivates her students through expert instruction, mentorship, and humor. Her lessons extend well beyond making beautiful music with a violin: students learn that practice, discipline, goal setting, and a positive outlook lead to successful performance." "I have been fortunate enough to have had violin guidance from Beverly for many years now. I am continually amazed at her insights and ability to identify and help me work out my challenges while never letting me forget the progress we have made. She is adept at personalizing practice techniques for individual needs. It only adds to the whole experience that she is a very sweet person!" "I have been studying violin for most of the past 38 years. For the last severalyears, Beverly has been my instructor. Her teaching has evolved over this time as she has sought to improve her own abilities as an instructor and as amusician. She places a strong emphasis on building solid fundamentalskills and techniques. She is familiar with a wide range of musical genres and styles that she incorporates into her teaching repertoire. Perhapsmost importantly, Beverly is dedicated to her students as individuals and to their advancement." "I started Violin 2 years ago at age 38 1/2. first 4 months struggled myself, since March 2006, I go to Beverly, and after each lesson, I "get it" what I was doing wrong, Beverly corrects my bad violin habit with this amazing listening ability.. she sure is a "professional" violin teacher. I'm with Beverly a year and half now, and I can play some "music" already. And I feel like myself becoming a violinist :) ""She is sometimes very tough, but to learn violin, I think we need someone who can teach you "tough" and "right". And she is the one." Ten years later, still a student of the violin, I received the opportunity to become a teacher of violin music and performance. In teaching Katana, a fourth grader, I had to find the right balance between encouragement, motivation, steadfastness and strictness. As a teacher, I gained a new appreciation for my own teacher’s instructional methods and her dedication in guiding me toward excellence. In the process of learning “Mary Had A Little Lamb” with my student, we dissected the tune by measure, and I encouraged her to give equal attention to every note. Just as I had believed in my early years, my student insisted that she knew exactly what she was doing and that she was not making any mistakes. As I taught the mechanics, I tried also to teach what I had learned from my teacher: what it takes to achieve excellence in violin. Every nerve controlling your fingers, energizing your body and soul, has to work in unison to bring life and depth to the music. I could tell, that by the end of the school year, my student was beginning to understand that perfection comes only through practice. Eleven years after beginning the study of the violin, the music and dedication I learned from my teacher have become part of my character. Perseverance for perfection, strength in musicality, and confidence in performance, each define who I am. The experience of teaching violin made me realize that, beyond mechanics, teaching the art, the depth, and the beauty of any subject is only possible when one truly exemplifies growth and passion.